​Children enter our school and immediately feel welcome. The classroom is carefully presented to allow for freedom of flow, small group learning, and individual mastery of each lesson and each piece of material. Our classroom has different areas for the children to choose from; ​Practical Life, Sensorial, Math, Language, Science, Geography and Art. Our teachers prepare the classroom, give lessons to students, and offer students encouragement as needed. It is the individual child who tries and triumphs, persists and discovers, and motivates oneself to master the multi-sensory activities presented each day. Pound Ridge Montessori School teachers are American Montessori Society (A.M.S.) certified with many years of experience creating a rich environment, in which we recognize that the only valid impulse to learning is the self motivation of the child. Our picturesque campus, which was a working farm until 1939, is a true extension of the classroom. In addition to time for free play and exploration, we use all aspects of the natural environment to enhance the Montessori curriculum. Our young artists ventured outside to paint "The Rock" following a lesson about cave paintings. After an Earth Day lesson, children planted and watered seedling trees in the school's woodland. 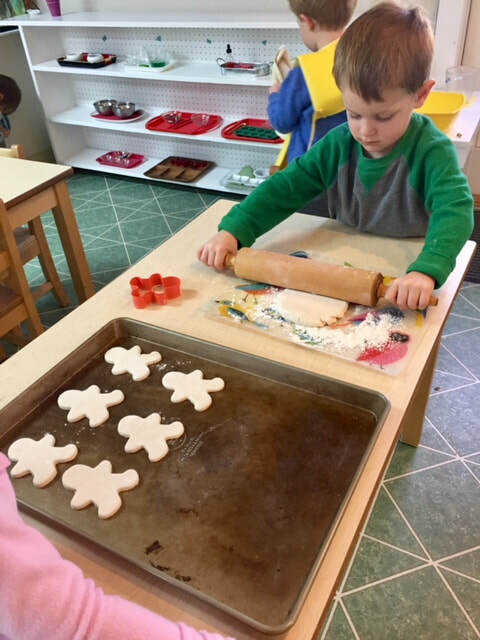 The Pound Ridge Montessori School is conveniently located on Highview Road in Pound Ridge, NY, close to Bedford, Katonah, South Salem, New Canaan and Ridgefield, CT.